Introducing the Official Credit Card of University of Maryland Alumni & Fans! 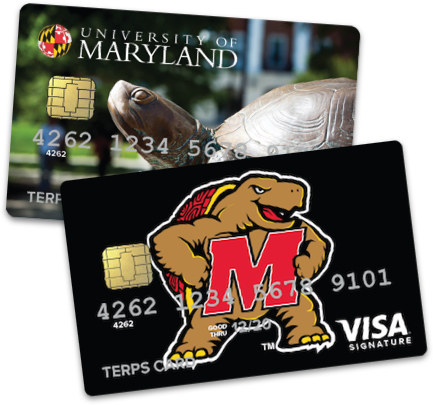 Stay fearless and show your Maryland pride every time you shop with the Terps VISA® Signature Rewards Card. Earn Terp Rewards on your everyday transactions and redeem points for exclusive travel, premium merchandise, events, and gift cards. PLUS, donations back to the University of Maryland Alumni Association. Earn 1 point for every $1 spent with your Terps VISA® Signature Rewards Card. Redeem points for the rewards you want! Enjoy all of the standard peace of mind benefits from VISA® plus enhanced VISA® perks and privileges. Redeem points for merchandise, travel, gift cards, and more!